Te’Sean was born to the parents of Tara B. Jones and Reginald Johnson on March 25, 2000. He accepted Christ into his life at a very early age thereafter his mom faithfully read the Bible to him for over 17 years. On September 3, 2018, Te’Sean would enter his final resting place. During his time on Earth, he brought an abundance of joy, laughter, and wonderful memories to all that knew him. 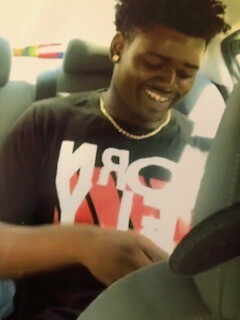 Te’Sean was full of life and extremely loving. He was down to earth, and simply amazing. Many people will remember him as a comical young man with a good heart. He always had a joke for you. Te’Sean loved his family and friends as much as they will always love him. He often brought friends home and would say to his mother, “Ma please don’t get mad and yell, but can they stay the night?” Other times, he would come through the door and exclaim, “Hi Ma, there’s my Tink! I haven’t seen you all day, give me a hug and a kiss.” He touched the lives of so many people. He had a passion for sports, especially a love for basketball. Te’Sean loved to eat, ride bikes, and play video games, his favorite game was Madden. He often took care of his niece and always let his niece and nephew have their way with him. His smile was captivating and had the power to brighten anyone’s day. Te’Sean's heart was and always will be as big as his smile. He was preceded in death by his grandparents, Ruben and Essie Mae Blue, Pastor Smithie L. Graham and Ernest Eatman; aunt, Nellie Thomason and godfather, Terrance Glenn. He leaves to cherish his precious memories with his mother, Tara Jones (Patrick); father, Reginald Johnson (Susie); sisters, Diamond Blue and Aakilah Evans; brothers, KeAndre Thomas, Kendeldrick Wallace and Kevin Archibald; very special aunts, Belinda Johnson (Marvin) and Sandra Jackson; aunts, Wanda Graham, Patricia Garrett, Charlene Spidell, Revette Maddox (Maurice) and Audrey Johnson (Larry); great-aunt, Ola Traylor (Bishop W.T. ); uncles, Timothy Blue, Andrew Blue (Latera), Terry Blue, Christopher Johnson, Billy Graham, Willie L. Thomason, Wayne, Blue, Nathaniel Dunn and Tyrone Johnson (Shalinda); nieces, Avani Evans; nephews, Ja’Kaiden Blue; special cousins, Moriah Waiters, Sabrina Thomason, Alfonzo Graham and David Jackson; godmothers, Natasha Smith and April Garrett; special friends, Ed Sheridan, Jr., Mystique Rogers, J’Shon Bentford, Jerry Rankin, Andra Garth, Garrick Randall, Jimmy Anderson, King Defoe, Ashalon West, Delante Jones and Elio Peguero; two special teachers, Tammy Gill and Mrs. White; and many others who will always love and miss him dearly.